I bought this pattern having been inspired by the ones I saw at A Dress A Day. I then spent the most of one day tracing the patterns (to keep the original perfect) and making a test version. However the pattern just didn’t suit my shape. So it needs a good home. 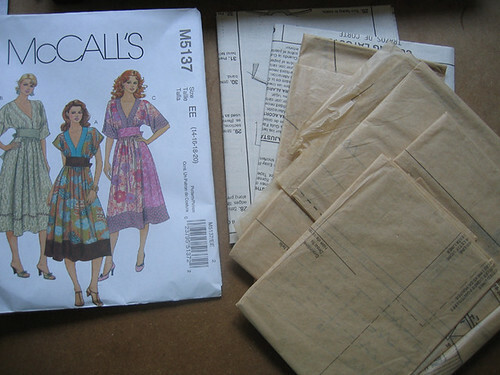 The pattern contains all the pieces (uncut) and instructions. It’s sized 14-20. Bust – 36" to 42"
Waist – 28" to 34"
Hip – 38" to 44"
I just bought that pattern too! I’m thinking of making a few alterations though, maybe have a little fullness in the skirt by putting a zipper in instead of ties. YES PLEASE! I love the center dress. What are we going to swap for?